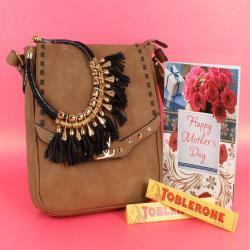 Product Consists : Golden Round Shape Western Neck Piece with Matching Earning, Red Sling Bag, Soft Teddy Bear (Approx Size : 6 Inch) along with Mothers Day Greeting Card. Make special efforts for your mother by gifting this and wish her Happy Mothers Day. Enjoy the mothers day with special gift like Special Surprising Gifts for Mother full of joy and memorable, for sure your mom will say thanks to you for creating such a beautiful moments for her. It is a gift which can be gifted in any season without any doubt. Say Happy Mothers day and if it is your first gift then you are much excited to be with your Mom deliver this beautiful gift So she can be proud to be your Child. Make your mom feel special by sending this perfect gift combo to her on any special occasion like Mothers Day, Birthday, and Many more. This hamper can be a perfect gift for women on any special occasion or festival like Valentine's Day, Birthday, Anniversary and Many more. Browse your favorite products, it is very conveniently available for online shopping from anywhere in India with Free Shipping.